UPDATE: Director Tom Holland will be on hand for Q&A before the movie! As I've mentioned before, the very first R rated horror film I got to see in theaters was Child's Play 3, and by the time the 4th and 5th films came around I had my own car and everything. 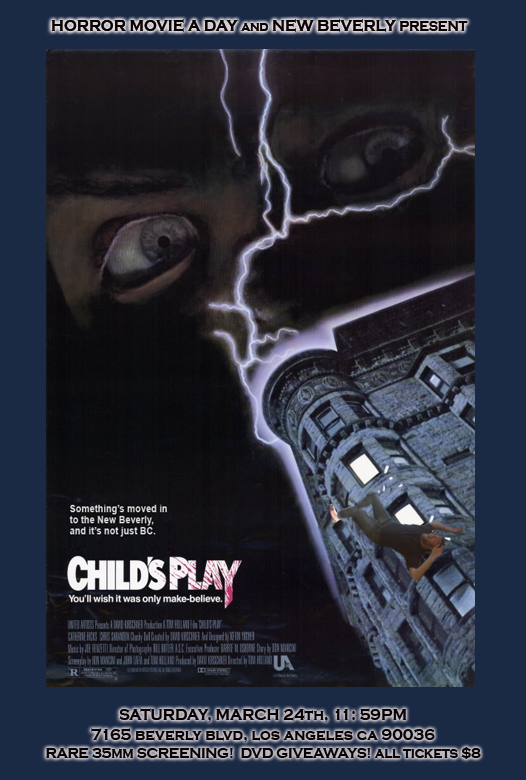 I saw Child's Play 2 on 16mm on a friend's backyard projection a year or so ago, but I have never seen the original (and best) Child's Play on anything but DVD and VHS. So it's about time I took matters into my own hands... I'll be hosting a rare 35mm screening of it at the New Beverly! I watched the movie again this week (Q&A prep in case a very special guest can work it into his schedule - cross your fingers!) and it holds up wonderfully: the FX are terrific, Tom Holland's well directed scares still work, and the balance between "Is it the kid or Chucky?" is still perfect even though we know the answer. And Chucky actually looks BETTER in this movie than he did in the later sequels, which just goes to show once again that there's no substitute for practical FX. If you're an LA reader who has yet to attend a HMAD screening: you're a horrible human being. Hopefully by now this is unnecessary, but just in case: the New Beverly is located at 7165 Beverly Blvd in Los Angeles, two blocks west of La Brea. Street parking is available on Beverly and side streets (Formosa is best bet). Tickets are 8 bucks CASH at the door or online at BrownPaperTickets. And it all goes down Saturday, March 24th at 11:59 PM! See you there!